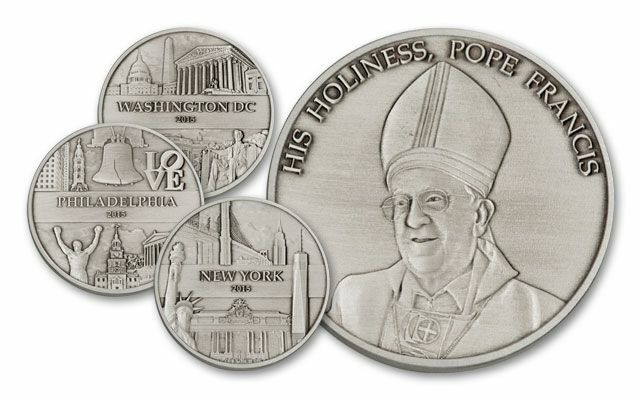 This 2015 3-piece Five-Ounce Silver Commemorative Set celebrates Pope Francis's FIRST EVER trip to the United States – it was a 3-city tour! The commemoratives features Pope Francis on the obverse and Washington D.C, Philadelphia or New York on the reverse (these are the 3 cities visited). Each individual piece comes in its own deluxe presentation case along with a certificate of authenticity and is struck in five-ounces of .999 silver. That's fifteen ounces of pure silver in the set! In September of 2015, Pope Francis I made his first trip to the United States as the pontiff. 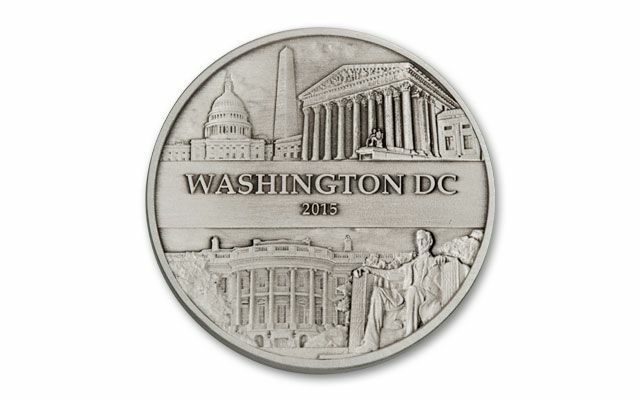 In celebration, Govmint.com exclusively released three different commemoratives that feature the cities he visited, Washington D.C., Philadelphia and New York. We are the exclusive distributor of these commemoratives. 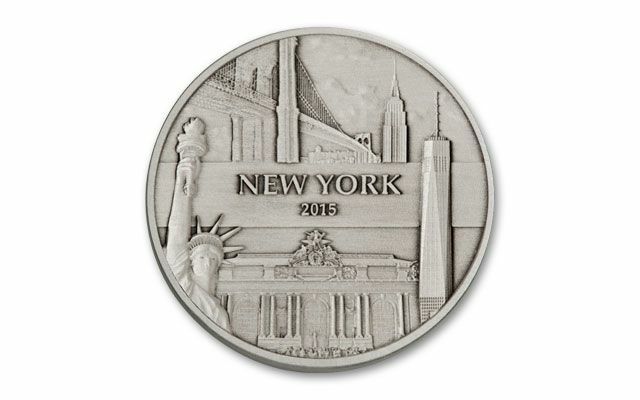 Each commemorative set features an extremely limited mintage of only 1,000. The obverse of this commemorative features the bust of Pope Francis. Washington D.C. – Featuring the White House, the United States Capital, the Washington Monument, the Lincoln Memorial and the Supreme Court Building. 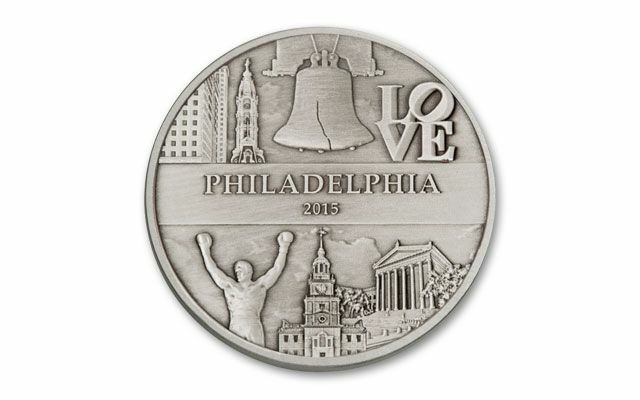 Philadelphia – Featuring the Liberty Bell, Independence Hall, City Hall, the Rocky Statue, Love Park and the Franklin Institute. New York – Featuring the Statue of Liberty, the Chrysler Building, the One World Trade Center, the Brooklyn Bridge and Grand Central Station. The commemoratives are struck in brilliant uncirculated condition with a stunning antique finish. This special finish enhances the details of the design. Each comes in a deluxe presentation case that displays the official crest of His Holiness and include a detailed certificate of authenticity. 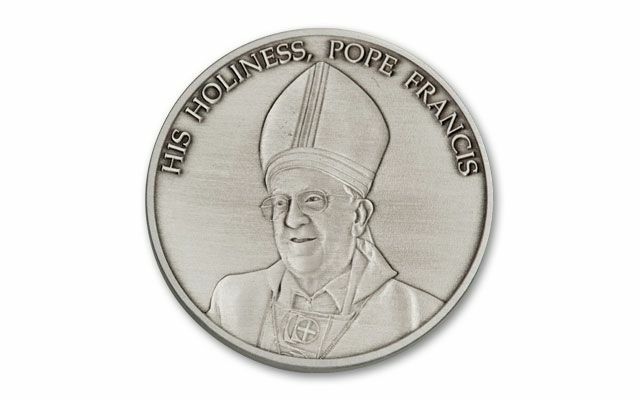 Secure this special silver tribute to Pope Francis today!